Our introduction to the Arab world, this oil-rich country has a first-class infrastructure, honest people and we enjoyed it very much. Oman was a real surprise - a first-world infrastructure wrapped in a Middle Eastern culture! The country has oil, people are well clothed and fed, new cars are plentiful (not flashy Mercedes, just good quality autos), streets are well-maintained, all water is clean and potable, and most essentials are available. But the culture is definitely Arab: most men wear, turbans and white robes, women cover themselves in black, some with slits for their eyes, some even cover the slits with black gauze. Life slows to a crawl during the hot mid-day, but around 6 PM life returns, and shopping picks up in the 'souks', often until mid-night in a logical acceptance of the 100º+ temperatures in this desert country. We were greeted by Mohammed (naturally), a tall handsome Arab dressed in flowing white robes and red turban. This set the tone for Salalah, a commercial port that has allowed itself to accommodate cruising yachts on their annual migration across the Indian Ocean. He handled all official matters politely and effortlessly, and made it easy to rent a car, shop downtown, and see the countryside. We are quite thankful for his help. The Port, built approximately 1996, is a major Maersk container port that shuffles containers between ships 24 hours per day. They have included a small-boat harbor, shared by Navy cutters, fishing boats, and yachts. We were one of 4 yachts at the time, but at the peak of the migration period 20-30 were jammed into the small spot, and 10 more anchored outside in a turning basin. A short distance from the front gate is the Oasis, a restaurant with western food that serves liquor (a rarity in this country) and has CNN on a big screen. Downtown Salalah had several good supermarkets, many laundries (someone has to keep those robes white!) and lots of shopping. In a rich Islamic country like Oman, the family women cannot work or mingle with men, while the men work, cook and meet at tea houses. So, at night, women go shopping and Salalah has streets lined with gold shops to cater to every need for finery. Under their veils, the women often are covered with gold jewelry, henna drawings, and dressed in Western clothes - think of a butterfly in moth's clothing! The Bible mentions gold, frankincense, and myrrh and Salalah has it all. Frankincense is a small shrub, that grows wild in Oman where the sap is collected, dried, and sold in many of the markets. 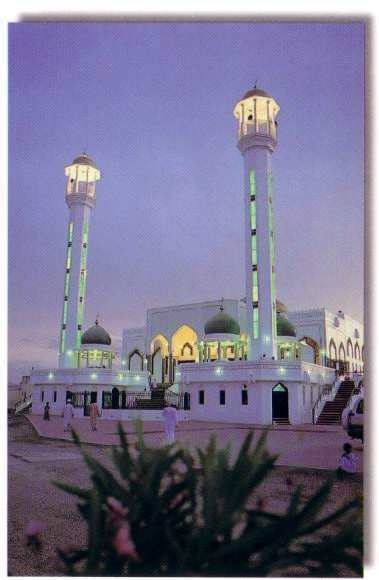 All in all, Salalah was an interesting, if not exciting, city. Once you leave the city, the roads and power lines are the main reminders of the 21st Century. We drove inland about 30 miles and East and West along the coast. 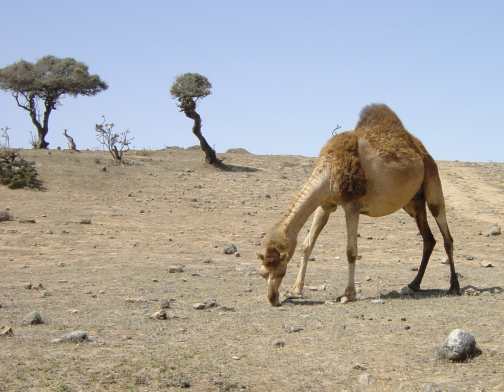 The hills are bare and rocky, camels and goats wander looking for the scarce grass or bushes. Higher in the hills, a little vegetation appeared, and the small farms had drinking troughs for cattle so they must get some rain. Along the coast were small towns, one with a 'fort' that we never found, but a good overlook to view a typical Middle Eastern town with the blue Gulf of Aden in the background. The town had a row of houses along the waterfront, but they looked like they did not get much use. Elsewhere we encountered complexes of townhouses near the beach, with the typical Arab high walls enclosing each unit - needed to protect the women from prying eyes of non-family members. Overall, we liked Oman, the people were nice to us and it was clean and safe. It would take some time to become accustomed to the culture, but it was a good introduction to the Middle East. The tone of the local officials changed a little the week that the United States invaded Iraq - no on was overtly hostile to us, but they became less friendly and outgoing. We are not sure whether it was our connection with the US, or a general watchfulness in case there was trouble from the locals. 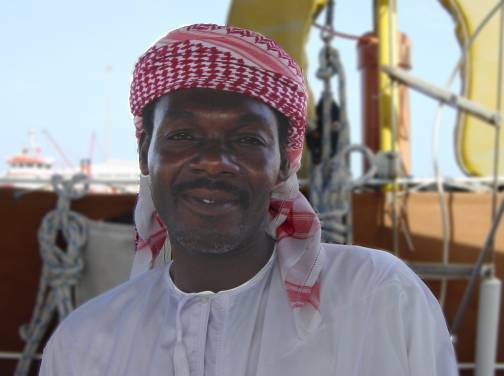 Our next passage was to be through the Gulf of Aden with several recent piracy incidents on our way to Yemen.